Basil is characteristically tea-like, with green/grassy, hay-like and minty notes. It is slightly bitter and musty. As one of the most popular herbs, basil is widely used throughout the world. 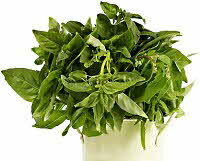 While there are many different types of basil, sweet basil is the most common. Sweet basil plants have large, oval, bright green leaves with small white flower clusters. The aroma is a complex mix of sweet and spicy with a strong and fresh clove-like scent. Much like its aroma, sweet basil’s flavor is warm and peppery, with a hint of clove and undertones of mint and anise. Basil tastes great in tomato and pasta dishes but it also gives a sweet-scented, minty aroma when crumbled over baked chicken, lamb or seafood. When making pesto or its French cousin pistou, sweet basil will yield the best results. Basil turns black when cooked in an acid medium like tomato sauce. Adding basil towards the end of cooking will serve to retain its aroma and flavor. It blends well with garlic, thyme and oregano. Basil leaves can be torn, chopped or shredded; however, cutting will bruise the leaf and cause it to darken quickly. Some people believe putting whole basil plants on a window sill will deter flies. Basil is also used in aroma-therapy products, as a landscape plant, and it is even dried and pressed as a part of homemade paper. Fresh basil, kept loosely wrapped in a plastic bag, will last about one week in the refrigerator, provided the leaves are not wet.